Do you have an account in State Bank of India (भारतीय स्टेट बैंक)? Maybe there are multiple reasons as to why you want to close your banking account that you have in SBI. If you wish to close your account in SBI through online means, then there are no such steps or process. You need to go to your home bank branch and close the account that you have. You can take the help of net to download the forms that you require for such closure, but ultimately you will have to be at the branch where you opened your account. Over here we will be discussing how you can close the account that you have in SBI. How to Get the account closure form? You need to have a specified account closure form so that you can close your bank account in SBI. By being at https://www.sbi.co.in/portal/documents you can easily have the form or you can get it from branch. You need to fill up the form carefully so that no mistakes are made. Step 1: Filling up of the form: The account closure form has to be filled in without any mistakes. The following details have to be mentioned in the form. Mention the process of transferring the remaining amount if any. You can choose any one of the following as per your wish, cash, cheque, DD or transfer to another account. Step 2: Returning the debit card, passbook and cheque book: You need to return the debit card, passbook and cheque book that have been issued by SBI to the bank. Step 3: The requirement of address proof: Some branch of SBI may be asking for an address proof of yours. So, it is prudent to keep it handy in case they ask for the same. 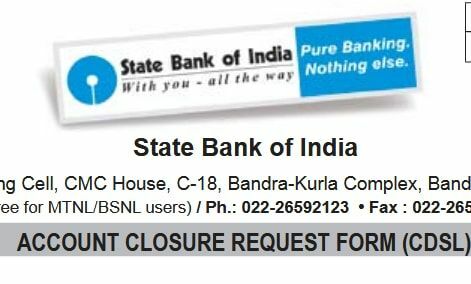 After the account is closed by SBI you will be receiving an e-mail in your registered e-mail address and also an SMS to your registered mobile informing you about the closure. You can also call the toll free number 1800 11 2211 or 1800 425 3800 if you face any problem with closing your SBI account.